Each month, the Health & Wellness Center at Magee Riverfront honors one of its clients as the “Wellness Triumph of the Month.” Today, meet Jim. Jim Custer is a web designer and married with two children, a son and daughter. On January 2, 2017, he started feeling ill. By the end of the day, he collapsed. He had suffered a spinal stroke. He was taken to St. Francis then to Christiana Hospital for nine days. He chose Magee for his rehabilitation, starting at the inpatient hospital then moving on to Magee Riverfront for outpatient therapy. After completing therapy, he was introduced to the Wellness gym. 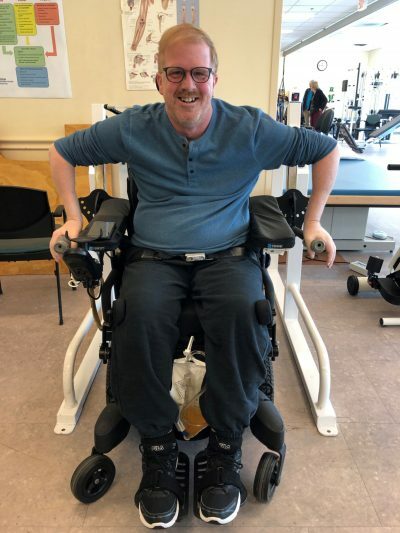 In Wellness, Jim enjoys using the stim bike, multi-trainer, arm bike, and standing frame to reach his fitness goals. In his spare time, Jim likes trying new restaurants and seeing live music at the Fillmore. March happens to be his favorite month, and he is very excited to be our Triumph! He would like to thank everyone who has helped him with his recovery, especially his wife Ellyn, without whom he wouldn’t have made it.